The game of golf is noted to have been created in 1457 in Scotland. The game has transformed tremendously since then which has led to the creation of the Professional Golf Association in 1916 by mostly club pros from around the United States. Eldrick Tont Woods, better known publicly as Tiger Woods, is easily considered as one of the best golfers to play the game, and has been a major contributor and icon to the association. In this blog, I will argue that Tiger Woods has affected the game of golf more than any player ever while focusing on his contributions to the globalization of the sport and television ratings. Globalization of sport has taken on many historical faces. The process of globalizing golf has similarities and differences with its competitors like rugby, cricket, and soccer. The most fundamental similarity is that these were all sports that were spread to different parts of the world mainly through European colonialism. A major difference amongst these previously mentioned sports and golf is that golf remained a game primarily for the wealthy to play for many years. This can be credited to the typically high costs of playing golf and the fact that golf is not a team sport. The “Tiger Woods effect” on the game of golf from a globalization perspective has been truly remarkable. I will prove that during Tiger’s peak years, golf changed from a hobby solely for wealthy businessmen into a game for ordinary people. Tiger’s own genetic makeup provides a platform for him to transcend the idea of intermingling cultures and globalization. His lineage contains traces of Caucasian, Asian, African, and Native American ancestry which caused him to coin the term “Cablinasian” to help describe himself and his heritage. Due to Tiger’s minority status, his charisma, and his dominant style of play, he ultimately attracted both a younger and a more diverse audience to the sport of golf. In fact, before Tiger Woods turned professional in August of 1996, the United States was averaging the construction of about 140 golf courses per year. Following Tiger turning pro, the United States more than doubled their average of golf courses constructed each year to 306 for the next twelve years on the premise that Millennials and Generation Z would pick up the sport at a faster rate fueled by the belief that Tiger would be the face of golf for years to come (Napton 2008). A real-life example of this belief was shown during the formation of the Tiger Woods Foundation in 1997 that promoted the participation of minorities and young players in the United States and around the world (Napton 2008). Essentially, the major upside to the market for Tiger Woods was clear in the United States, and the rest of the world was not far behind. The construction of courses in Japan, South Africa, Australia, and many more nearly doubled as well. Tiger Woods affected the game of golf in its entirety in a multitude of ways. The Professional Golf Association is an organization that has constantly had to put an emphasis on the amount of television spectators it receives during broadcasted tournaments, most especially during majors such as The Masters, The U.S. Open, The Open Championship, and the PGA Championship. No player positively affected the number of viewers these tournaments received than Tiger Woods. There is a variety of reasons that contribute to this phenomenon. Perhaps the most prominent reason was Tiger’s ability to absolutely dominate the field. In an individual sport like golf, it really is amazing as to what Tiger accomplished and with the margin of victory he typically did it. Tiger was famous for setting records for victories in majors by the largest margins in history. Some examples of these are his 1997 Master’s victory by twelve strokes and his famous, record-breaking fifteen shot victory in the U.S. Open in 2000. The effect on TV ratings is stunning. 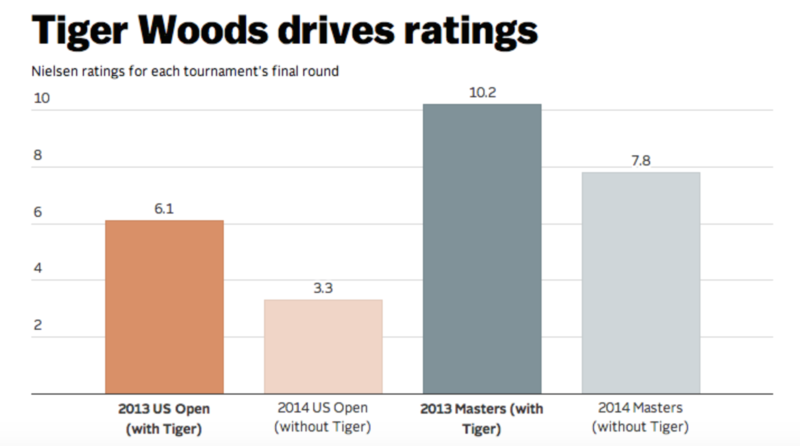 Figure 1 shows the Tiger Woods effect on ratings during two of the major tournaments during peak years with the nominal figures representing viewers in millions. As shown in Figure 1 Tiger Woods nearly doubled the number of viewers for the US Open from 2013 to 2014. The realization that one player is that vital to the PGA and the game of golf is absurd. This effect on TV ratings can be seen in modern sports today with LeBron James in the NBA and Tom Brady in the NFL, however these do not come close to comparing with the effect of Tiger Woods. As most of the world knows, in 2009 Tiger faced a severe publicity nightmare when the news came out that he was unfaithful to his wife. Following this, Tiger faced multiple injuries that took a large toll on his ability to compete over the next several years. Other instances from his personal life were appearing in the news as well such as an alleged DUI and his statement to take a course on medication management. However, after brutal publicity and injury battles, it was this year in 2018 when Tiger played in the 82nd Masters tournament that caused the television ratings to go from just under eleven million in 2017 to over thirteen million in 2018. CBS has credited a large part of the ratings spike to Tiger’s return. The Tiger effect on the game of golf still exists today.